Paco Rabanne Black XS Potion Pour Femme was created for her sensual & daring. Paco Rabanne Black XS Potion Pour Femme 80ml. Eau De Parfum - This long-awaited new, fascinating, magnificent, incredibly beautiful fragrance Black XS Potion for Her greatest master of Paco Rabanne. Eau de toilette limited edition, but this only increases its value. Perfume creators are such honored masters of perfumery business as Olivier Cresp and Emily Kopperman, their regalia, and a list of recognitions is immense. Top notes offer a magical aroma of grapefruit, so air and sunlight, it is considered that it is the smell makes a woman younger than in the eyes of men. Note the "heart" is revealed on the skin an incredible, mysterious scent ET hellebore flowers pink and tender, subtle chord black rose Baccarat. Luxury loop underlined precious ebony and not less valuable natural amber. Shocking, luxury, elegance all merged in the magic elixir of love Paco Rabanne Black XS Potion for Her, all the same rock, all the same carnivorous flavor, all the same incredible and fascinating, like the entire line of "Black XS"! Release date: 2014 Manufacturer: France Gender: Female Classification of flavor: floral, woody Top notes: grapefruit Note the "heart": color pink hellebore, Baccarat rose Final note: amber, black sandalwood Perfumers: Olivier Cresp, Emilie Coppermann. a remake of the popular women's fragrance, which was released in 2014. Perfume, together with a male, is a duo that was created by the famous perfumers Olivier Cresp and Emilie (Bevierre) Coppermann. Belonging to a group of oriental floral, this attractive aroma as well as possible, highlights the distinctive features of a woman, her sexuality and romantic, mysterious nature. Fresh and delicate notes of grapefruit open composition. What follows is a beautiful, feminine heart of the fragrance, marked notes of red rose and hellebore. 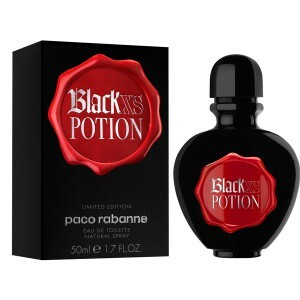 Ends composition Paco Rabanne Black XS Potion for Her long sound sweetish, hazy and refined notes of sandalwood and amber.